Summary: Is trading binary options on MT4 a good idea? Absolutely! Lately, a lot of people have been emailing and asking me about new and different ways to trade binary options. Most traders use platforms that all look very similar, like SpotOption, TraderSoft, Marketpulse etc. These platforms are used by many binary options brokers, but they aren’t the only option. Today, I’m going to be introducing you to trading binary options in MetaTrader 4. This is something I’ve just recently started testing, and I’ve been very impressed with the results. A lot of you are going to ask me how is it possible to trade binary options in meta-trader 4? It’s actually quite simple. There are a handful of brokers that deal with Forex first using MT4, that it started to offer binary options services. I am currently testing Core Liquidity, and my first impressions are good. I won’t be providing a recommendation for you do sign up with MT4 binary options broker today, but this is certainly something you can test and trade on demo account. What I really like about trading binary options in MT4 is the fact that I receive all of my signals in this platform already. Right now I have over 20+ charts open in my account running Binary Strategy. You can see this in the example below. What I really like about this, is that I can receive the trades and placed the trades in the exact same place. This makes it easier for me to analyze the charts and do basic price action to ensure that the trade signal is worth trading. It’s actually extremely easy to trade binary options in meta-trader 4. All I do is this, when I receive a signal, I right-click on the chart, select trading and then select a new order. Then, you will see that this pops up a very simple binary options trade window. Here you will see all the important binary options aspects you are used to. Such as, the pair that you are trading, the investment you want to make for that trade, the expiry time, the pain win payout percentage and the trade return. Once you open the trade, it will use the meta-trader 4 prices to determine the outcome of that trade. This is much more effective than most binary options platforms because this platform doesn’t have a long history of market manipulation like most binary options brokerages. I feel like this separation alone is worth giving it a shot. Another major benefit of trading binary options in meta-trader 4, is how easy it is for you to paper trade. You can open a new MT4 demo in the matter of minutes, without ever having to fill out any real information. This makes the process fast, and gives you the opportunity to trade without any risk at all. This is a great way to test and work on your Binary trade strategy, and it’s something that I do all the time. Trading binary options in this manner, can help you develop new strategies and become a lot more comfortable with taking calculated risk. Every time I’m working on a new strategy, or trying a new binary options software or signal service, I always use an MT4 binary options demo. Another reason why trading binary options in MT4 is effective, is because it allows for results tracking. You can use tools like Myfxbook to keep track of all your trades and even share them with the community. I haven’t done this yet, because the majority of my live trades aren’t on this paltform, but I would like to at least provide a trading session or two in this manner to show you exactly how I operate. There are many benefits to trading binary options on the MetaTrader 4 platform. What do you think about this concept? Thanks for reading and please leave your comments and questions about this new way to trade below. To download the application that lets you trade in your MT4, just click here. 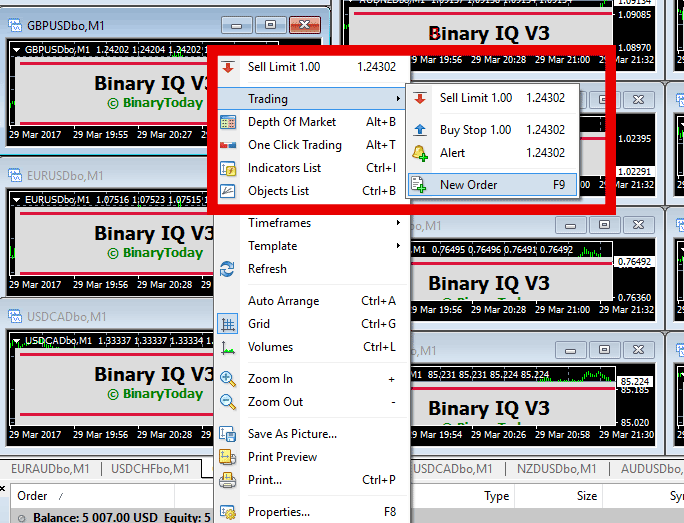 I downloaded the application to trade binaries on Mt4, after running it i didn’t see any change. Am i supposes to load it in indicators folder of MT4? Hi Akpos, you just have to open charts with BO on the end, then it will work. Hi Bethel, should just be a double click to open it. Hi Rehema, you can download MT4 easily from hundreds of sources, just do a quick google search. John do you know how it works GDMFX broker.Do you withdrawal the money without any problems? Hi Martin, I have not tested this broker you mention. Sorry that I can’t be of more help. There is no MT4 for IQ Option Derick. hi john i want to start trading options on MT4 do they offer manual closing of trades on MT4 like they give on forex trading? Hi Lewis, binary options is generally expiry time based Lewis. This is the same in MT4. Hello, please i am having problems, when i use other mt4 platform to trade on Binary, sometimes when the platform wins binary won’t pay me. I think the platforms and binary don’t correspond. I need advice. I’m not sure what you mean Kaycee. Can you elaborate? Please which MT4 platforms suites Binary trading? Sometimes when i use other platforms to trade on Binary, the platforms will win and binary won’t pay me. I think sometimes Binary doesn’t correspond with other MT4 platforms. Sometimes in other MT4 platforms you will see a setup to enter in the market and to other MT4 platforms is not a setup. This issue is giving me a lots of concern and problems. When you take your time and check other MT4 platforms you’ll see that the movements are not the same and some MT4 platforms will win and at the same time others will lose. Example 9:00 am, some will win and some will lose at that same time. Please i need some advice and answers. I don’t understand Kaycee. I recommend contacting your MT4 broker if you are having issues with their platform. Thanks for your affirmative response, i saw some of the Binary options strategies posted on this website, if i may ask, which of them gives more winning rate. Do you know any compatible MT4 binary options brokers.Binary options directly on the MT4 platform? could you please give me some possible options as i am about to pull my hair out! thanks John i appreciate your prompt Reply. they say i they don’t have facility to use BS. Their platform prices compared to mt4 are very different. I am enjoying your podcasts. Hi, your coupon code is nice but I don’t know how to use it ? Hi Jo, there isn’t a coupon on this page. What are you referring to? I know only CLM and GDMFX. Those both work, hopefully more to come moving forward. I think this provides a good opportunity for automation. I am pretty sure that the development team of Forex steam can definitely find a way to automate binary options using systems such as Binary5 or Binary strategy on MT4. This would be awesome. What is your take on this? Hi Des, it’s a very interesting thought. I wouldn’t mind more automation in my life, but we still need compatible MT4 binary options brokers. There are still very few. Do you use Forex Steam? Thanks kindly in advance for sharing your experience. will you be doing a review on the broker – Core Liquidity Markets – shortly? I have just completed a trial demo period with them too and have found it very useful to be able to trade from my MT4 platform. All 29 pairs are available on 30min, 45min, 1hr and 2hr. 27 pairs available on 10 and 15min. 26 pairs on 20min and 18 pairs on 5min. 10 pairs on 60seconds and 7 pairs on 2 min. It all sounds good from this perspective, but more importantly, are they safe to trade with? Thanks kindly for the amazing service you offer. ps – are there any brokers you know of that are using FX Lite? I’m confident in CLM Anthea. They seem respectable. Thanks kindly for your vote of confidence John. Also, are there any brokers you know of that are using Trade Tools – FX Lite? Isn’t CLM Forex using it? It felt the same to me. Slightly fewer currency pairs but includes nearly 40 additional indices, commodities and stocks. The broker is in control of the assets they provide. I downloaded the link to my computer and I too dont see the screen that is in the write up and I closed the program and reopened any other ideas to get it to work? Do you have MT4 installed already? I believe you need MT4 installed first. yes I have mt4 already installed I selected my program when I did the demo account. It should work then Katrina. I guess you would need a broker that allows binary options through the MT4 platform right? Not just any Forex broker with MT4? If so, where can I find such broker? If you do have a newsletter I would definitely subscribe to it. Sounds great Henry, you can find our mailing list at the bottom of this post, before the comments. Which broker’s MT4 app do you use? Can I use an EA to trade? Yes, you can, but I don’t know of any Binary EA’s built specifically for this market. I noticed that after I select New Order on a chart, a window appears that looks more like a forex trade window rather than a binary options window. Try restarting the platform Jon, and make sure you installed the file correctly. After installing FXLite, you should have an FX Lite for MT4 shortcut on your desktop. Make sure you are opening MT4 by using this shortcut. Hope that helps. My apologies, I assumed that would be known, but I’m glad you are pointing it out.